and as a pivotal point in the movie When in Rome considering that it sets up all of the ill-advised, one-note romantic comedy hijinx that follows. Unfortunately and as gorgeously as this moment looks on pitch perfect Walt Disney Blu-ray, it's a terrible shame that nobody bothered to take a cue from David Diamond and David Weissman's abysmal script and save Bell along with the rest of the cast from what is so far truly one of the absolute worst movies to have been released in 2010. 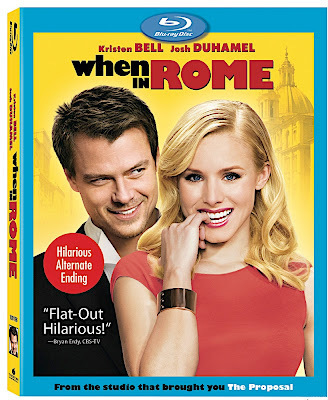 When in Rome is horrifically unfunny and just plain ghastly to the point that repeatedly it makes you contemplate just what on Earth Disney's Touchstone Pictures was thinking to waste money on such a disaster as any wedding related movie with a gimmick seems to wind up greenlit in Tinsletown. As such, the film operates with a magical only-in-the-movies twist that the owners of the five coins picked up by Bell will fall one hundred percent under the blonde New York art curator's spell. Never stopping to wonder what would've happened if any of the coins had belonged to women or men who were gay or married with children or at the very least, men who didn't speak English or have the means to follow Bell like a puppy dog back to the Big Apple, the group of men who are so cartoonishly over-the-top that they seem to be escapees from a Disney animated work as modern day dwarfs all quickly try to win over the girl's heart. Comprised of Will Arnett's Roberto Benigni in Life is Beautiful inspired painter, Jon Heder's half-baked magician, Dax Shepard's self-obsessed male model, Danny DeVito's sausage tycoon and Josh Duhamel's reporter (who may or may not be the owner of the fifth coin – a poker chip), the group of men track down Bell and proceed to overwhelm her with over-the-top displays of affection. 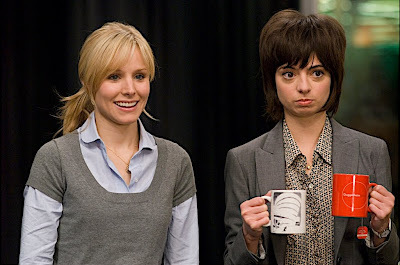 Introducing us to characters like an ex-boyfriend (Lee Pace), Bell's sister and type A boss (Anjelica Huston) who are used as mere one-dimensional stepping stones to move the plot forward, the film is so unrealistic, unfunny, unrelatable and downright unlikable in its execution that nothing about its leads feels the least bit genuine or authentic. And again by forcing some pretty naturally funny people into roles that don't even accidentally make us giggle, this makes the decision of Bell's character to curate an entire show at the Guggenheim that all centers on the celebration of pain seem terribly ironic. Namely, it's remarkable that nobody understood the tragedy that they were making a movie that could've qualified as a submission for the onscreen exhibit. Not even passable as “airplane movie entertainment,” which probably explains why Disney saved the extra money and DVD by skipping the option of giving consumers a digital file or combo pack of Johnson's lackluster work, When in Rome is only of interest to screenwriting students to watch as a project to decipher just how much about the writing went wrong and how much better the film could've been even with retaining the ridiculous fairytale premise.